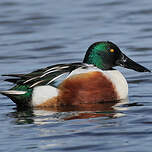 Male Northern Shoveler is easily identified amongst all others by its large grey beak, widened at the extremity, its bottle green head and its yellow iris. 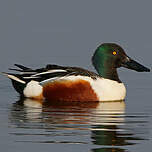 It has white chest, brown belly and flanks, and black back. 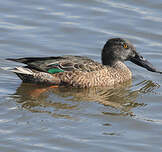 Its wings are pale blue at the base, with an angular green and white spot. In its back's continuity, the tail is black and white, with black undertail coverts. Feet are red-orange. 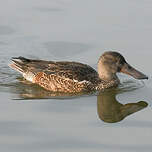 Female has brown plumage. 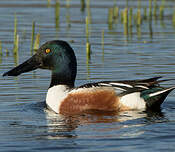 The Northern Shoveler is slightly smaller than the Mallard to which it looks a bit like by the color arrangement. 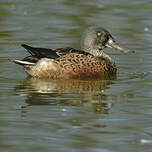 The Northern Shoveler quacks, but it is very silent. It can be heard only in spring. The male emits a serie of rrow rrow rrow took took. The female does gack gack. 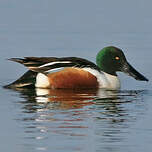 In a normal season, the Northern Shoveler frequents ponds, marshes, river armlets. They are particularly fond of fresh and brackish waters. In winter, it looks for the mildness of maritime coasts. 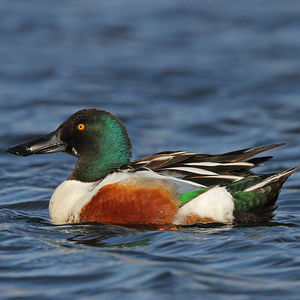 Northern Shovelers migrate early with the first frost. 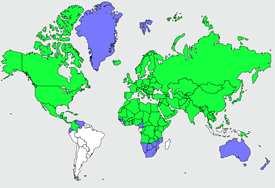 They leave Scandinavia or Continental Europe for temperate and warm zones. Some cross even the Mediterranean and the Sahara to establish their winter residence in the southern hemisphere. It flies with stretched neck, giving the impression that wings fall very much behind the body. 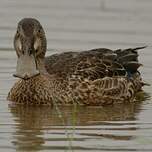 Its spatula-shaped beak is particularly adapted for riddling and catching food. 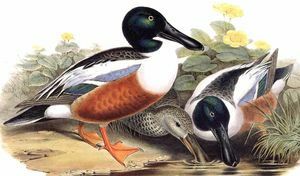 Amongst the anatidae, the Northern Shoveler is the one that has the most sophisticated filtration system. 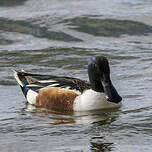 Moving continuously its beak from side to side in the water, it filtrates and retain edible particles while it rejects water on the side. Its diet is mixed: vegetables and also little aquatic animals, shellfish, molluscs and plancton captured in shallow waters or filtrated from the layer close to the surface. The nest, placed on the ground near the water, is lined with the female's down. In april or may, females lay from 8 to 12 eggs. 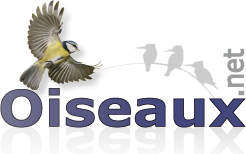 Incubation takes place during 22 or 23 days. 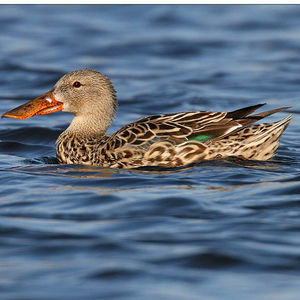 Like many other ducks, chicks are precocial: they leave the nest immediately after hatching. 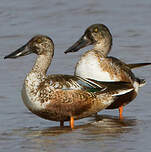 Raised by their mother, young Northern Shovelers fledge at about 6 weeks. 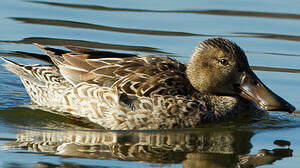 Unlike other surface ducks, the male looks after its territory after hatching. This behaviour could be related to its feeding habits that take a large part of his activity.